I can safely say that I know absolutely nothing about Capcom’s Devil May Cry series. Sure, I’ve been aware of its existence. I know it was originally conceived as a Resident Evil sequel when the first installment hit the Playstation 2 in 2001, and I know that there’s a main character named Dante with an obscenely large sword who fights demons in decidedly old-school hack and slash fashion. But that’s it. So why the hell do I own the fourth installment? Curiosity, I suppose. 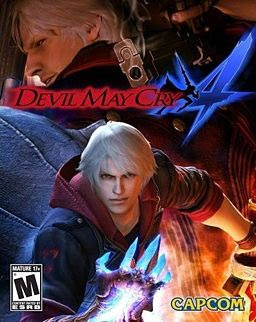 Devil May Cry 4 has gotten some solid reviews across the board. It looks great, even if the gameplay is a tad archaic. However, seeing as how I’m a DMC newbie, I doubted this would be a problem. So off to GameStop I went, with trade-in games in tow. I sacrificed three games to the second-hand game gods that day: Lost Planet, Fight Night Round 3, and Super Paper Mario. The first two were impulse buys that I never warmed up to, and Super Paper Mario—my only disappointing Wii purchase thus far—turned out to be less inspired than Internet fanboys would have you believe. With these trade-ins, I walked out with a brand-new release for a mere $13. I love it when a plan comes together. I came home, fired up the XBox 360, picked up my controller and launched into one of the most incomprehensible narratives I’ve ever seen. I’ve read the plot synopsis on the back of the box and I’ve read the intro in the instruction manual, but this game is still completely foreign to me even after hours of gameplay. The basic gist, I imagine, is that you’re a knight named Nero who is trying to track down Dante—the protagonist from the first three games—while fighting hundreds and hundreds of demons along the way. I’m sure I’ve oversimplified a tad, but that’s all the back story I need to enjoy the hell out of this thing. And so far, I really have enjoyed it. There’s not a whole lot of strategy involved. You’ve got a sword, a gun, and a demon hand that’s good for grappling and swinging ice demons around by their faces. You’re rewarded for dispatching your enemies stylishly, and you can string together any number of combos. There’s also an RPG-esque ability system that lets you purchase new attacks as you progress. Like any hack and slash worth its refreshingly violent salt, this game has some ridiculously fun boss battles. You're pitted against rogue angels, fire demons, monstrous killer plants and giant ice frogs. If you’re like me, you need a giant killer ice frog in your life. And guess what? Devil May Cry 4 brings the ice frog and brings it hard. This game doesn’t reinvent the wheel, and if you’ve played other entries in the series you probably won’t find much new here. But if you’re like me, and are new to the series, Devil May Cry 4 isn't such a bad way to spend a few late nights in these bitter winter months.